(Bloomberg) -- China’s financial sector is dividing opinion across its borders in a way not seen since the global credit crisis. 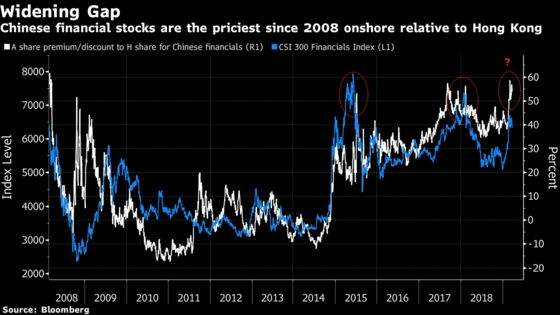 Traders on the mainland are paying the most in more than a decade for shares of Chinese banks, brokerages and insurers relative to their offshore-based counterparts, according to data compiled by Bloomberg. The same firm is now on average 54 percent pricier onshore versus a 15 percent premium typically seen in the past ten years. A gap exceeding 50 percent tends to precede sell-offs onshore as the prices converge, as they did in 2018 and 2015. Recent enthusiasm for yuan-denominated stocks means the Shanghai Composite Index is set to beat the Hang Seng China Enterprises Index this quarter for the first time in two years. While China’s financial sector has benefited from increasing risk appetite on both sides of the border -- as well as surging turnover and looser trading rules -- investors in Hong Kong are less sanguine as economic growth slows and sour loans pile up. “The A/H premium will narrow,” said Steven Yang, head of China A/H strategy and products at CLSA Ltd. in Hong Kong. “A drop in A-share prices and an increase of southbound flows into H-shares will drive the narrowing of the premium. The market will turn to fundamentals again and revisit valuations after the rally." Citic Securities Ltd., whose yuan-denominated stock is among the most active and best-performing Chinese large cap this year, is trading near a record discount in Hong Kong. The gap for China Pacific Insurance Group is also near a record, while that of China Life Insurance Co. is about the widest in a decade. The exuberance onshore has started to deflate after weaker-than-expected results served as a warning for investors that expectations were running too high. Shares of Citic Securities have lost more than 7.8 percent on the mainland after net income fell short of expectations last week. Huatai Securities Co., which reports earnings Friday, has slumped 8.8 percent this month as traders dial down their profit estimates. China has just lowered its goal for gross domestic product this year, which also doesn’t bode well for a sector that’s sensitive to economic growth. An index tracking financial stocks in Hong Kong is up 13 percent in 2019, lagging the 24 percent rally for an onshore gauge. Mainland investors are already making the most of the arbitrage trade via trading links with Hong Kong: among the top 10 most purchased stocks in the city this year, four are dual-listed financial firms that are significantly cheaper than in Shanghai. That includes Citic Securities and Bank of China Ltd.
"When valuations of the same A-shares expand to an unreasonable level, investors could consider switching their investments from A-shares to equivalent H-shares," said William Yuen, Investment Director at Invesco in Hong Kong.